Boris Johnson has announced plans for a £200m snow dome to be situated next to London's Olympic Park in Stratford. The indoor ski centre will be funded by shopping centre developers Westfield and will be the first of its kind in London and the largest in the UK. Set to open in 2015, the development will include 20,000m2 of piste, including a 300m run, covered in 'real' snow. 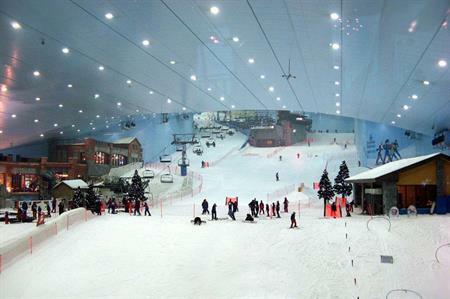 Aiming to attract three million visitors a year, it will be double the size of similar snow centres in Hemel Hempstead and Milton Keynes, and will sit alongside Ski Dubai (pictured) as the world's largest. London Mayor Boris Johnson said: "Stratford’s status as a stunning new destination is confirmed by Westfield’s plans for a world-class indoor ski centre. This underscores the massive confidence in this area from investors, which is delivering a real payback for taxpayers in terms of jobs and the regeneration of east London." Meanwhile, the Mayor also provided an update on the Olympic Stadium: "This weekend, elite athletics returns to the magnificent Olympic Stadium [for the Sainsbury's Anniversary Games] and major contracts are now in place to transform the venue into a multi-sport arena."